It will happen over and over again during the next few months. I'll be hanging out with my friends. We'll probably be at a bar. I'll almost certainly be drunk. We'll have talked about music and books and movies and politics and now, somehow, someone's made a mistake. They've slipped up. Somebody's left me an opening to start talking about baseball and I've taken it. I'm all excited, rambling on, ranting, words pouring out my mouth in a stream of back-up shortstops, obscure statistics, and twenty year-old home runs. For a while my friends will be able to feign interest, but before long, every other pair of eyes at the table will have glazed over. 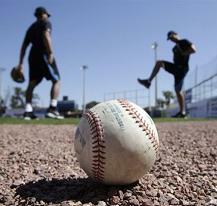 "No baseball fan has to explain his mania to any other baseball fan. They are a fraternity," John K. Hutchens once wrote. He was a critic for the New York Herald Tribune, editor of the New York Times Book Review, and a White Sox fan. He saw his first game at Comiskey Park in 1913. "It is less easy, often it is hopeless, to try to explain it to anyone else. You grow technical, and you do not make sense. You grow sentimental, and you are deemed soft in the head. How, the benighted outsider asks you with no little condescension, can you grow sentimental about a cold-blooded professional sport?" And yet no matter how hopeless it is, I can't help trying. Like every other baseball fan in the world, I'm convinced the sport gets better and more entertaining the more you learn about it. Pay attention long enough and you suddenly find those pauses between pitches are spilling over with thoughts and arguments and questions and ideas and the endless stories from a history that stretches all the way back to the days before the American Civil War. The guy who threw a no-hitter on acid. The pitcher who loved firetrucks so much he raced off the field in the middle of a game to chase one down the street. Everything Babe Ruth ever did. Before you know it, you're spending the seventh inning stretch wrestling with all of life's most pressing questions. Free will vs. determinism. Faith vs. reason. Science vs. religion. Ayn Rand-style supermen vs. socialist collective enterprise. And whether or not to bunt the runner over from first in the late innings of a tied game. So, despite my better judgment, here I am, starting a new baseball blog in the naive tradition of Sisyphus, Don Quixote and the Chicago Cubs. I will try to fully explain the million different reasons I love the sport, and I will fail. I will tell crazyass stories, ramble on about my favourite players, and try desperately to convince you that BABIP and OPS+ and WHIP are all fascinating statistics. There will be charts. And graphs. And I promise they'll be awesome. Sort of! Maybe! Mostly the whole thing will just be a chance for me to talk about one of the things I love the most in life. Without actually having to see your eyes glaze over while I do it. I'm excited. Happy Opening Day. Follow The Baseball Posts on Twitter @LilRedBaseball. Photo: Blue Jays Spring Training, from Daylife via The Blue Jay Hunter. I can assure you my eyes will never glaze. It is indeed hard to describe. Like the beauty of the game is an inside joke between its admirers.